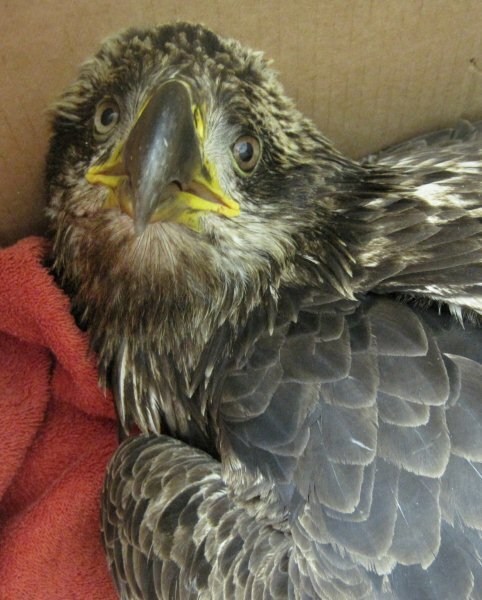 A group of deer hunters went from hunting deer to saving a Bald Eagle in a matter of a few short hours. They are our first REGI heroes of the day. It was mid-morning when a call came in from Kendra Sawyer. Kendra was a REGI Intern in the summer of 2008. She was home recovering from a bout of the flu when her boyfriend called for help. He was deer hunting and came across an immature Bald Eagle lying in the woods. He knew the bird was alive only when she lifted her head slightly. We have transporters, but no volunteers in the Bancroft area capable of catching up even a very sick eagle. Additionally, walking the woods during deer hunting season is not safe unless dressed in regulation orange clothing. I gave Kendra the bad news. We could help the bird, but were unable to make the 2.5 hour drive each way to search for it and get it out of the woods. It will be a long night tonight. I will be with her most of the night. 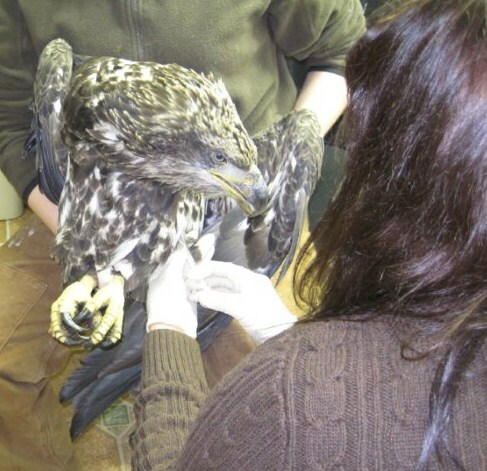 We quite literally have to hold large birds such as Bald Eagles so they do not break their wings during the convulsions. The beautiful bird has many strikes against her. As I write this she has had two injections of CA EDTA. I hope the chelation therapy begins to work soon to ease her suffering. 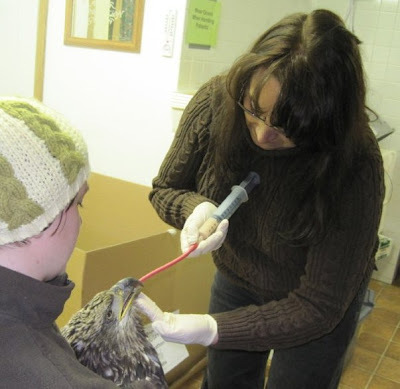 I have included several links below for your interest in how wildlife and people are exposed to lead during and after hunting season. Lead is a toxin. We as a species are well aware of that. Lead has been removed from all other aspects of our life. Last year there was a huge outcry when a bit of lead showed up in the certain colors of paint used in childrens toys that come from China. For some reason however, lead ammunition is still used in most states in the U.S. for hunting, and lead sinkers and jigs for fishing. 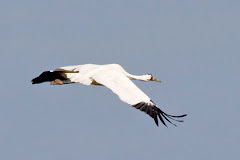 We and our children eat the meat and wildlife is put at great risk as well. Thanks to Scott Diehl, for providing the sites. Tis the season as they say. For us and for wildlife in the country it is "Lead poisoning season". This is the first of the lead poisonings this fall but it will not be the last. Keep us in your thoughts tonight. A Fun Filled Week of Education! Patient UPDATES! Our Bald Eagle Cage Underway! Have A Heart for REGI - A Deer Heart that is!